The Taoiseach has said that while Brexit has defined the UK it does not have to define this country which he said remains in control of its destiny. 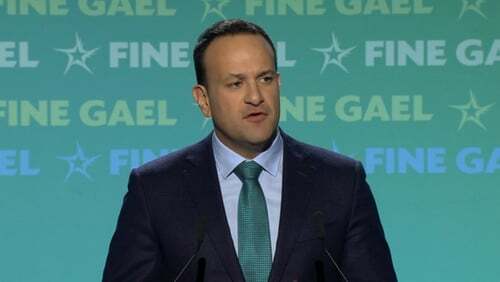 At an address to delegates at the Fine Gael national conference in Wexford, he said the next general election will take place between now and 2021 and he said his party would not enter coalition with Sinn Féin under any circumstances. With nods to tax cuts, new schools in every county and a new slogan that Fine Gael is tried, tested and trusted to keep the economy strong, Leo Varadkar’s keynote speech had all the hallmarks of one delivered in the run up to an election. But there was something of a mixed message with the Taoiseach saying an election will take place sometime between now and the end of next year. He took a swipe at Fianna Fáil who he said had no ideas and no policies. "There are lots of good people in Fianna Fáil but right now it is a party with no ideas, no policies, no alternatives." He also hit out at Sinn Féin who he said had plenty of ideas but no policies either. "Sinn Féin is a party with plenty of ideas and policies. Bad ones. Higher taxes, more borrowing, more debt. But the bigger problem I have is that the values of Sinn Féin are toxic," said Mr Varadkar. "At some point between now and the summer of next year, there will be a General Election. And I can tell you tonight that under no circumstances will Fine Gael enter government with Sinn Féin," he said. The Taoiseach finished on Brexit saying: "Brexit will define and consume the United Kingdom for the next generation. It doesn't have to define us." Earlier, Mr Varadkar said the Government has a rough and preliminary plan in place to avoid a hard border in the event of a no-deal Brexit. He said it would involve difficult talks with the European Commission and the British government. "If we end up in a no-deal scenario, we’d have to have some difficult discussions with the European Commission and also with the UK government as to how we can avoid a hard border," he said. With the prospect of a no-deal scenario looming, the Taoiseach said some difficult discussions would be needed between Ireland the EU and Britain. But such talks are already taking place and Mr Varadkar said they are at this stage very rough and very preliminary. He said he would expect the British Government to stand by its commitments under the Good Friday Agreement, and to stand by its commitments made in December 2017 to retain full regulatory alignment with the EU if that was necessary to avoid a hard border. He said this gives a sketch of what is required to avoid a hard border and the more you get in to it the more it looks like the backstop. "First of all we would expect the British government to stand by its commitments under the Good Friday Agreement, we would also expect them to stand by their commitments in the December 2017 declaration where they agreed they would retain full regulatory alignment with the EU if that was necessary to avoid a hard border. "The more and more you get into it, the more and more it’s looking like the backstop." Earlier Minister for Finance Paschal Donohoe has said that he has already started working on Budget 2020 and is confident it will be passed next autumn. Mr Donohoe was speaking on the second day of the Fine Gael National Spring Conference as he and his colleagues played down the possibility of a general election taking place this year. Mr Donohoe, who spent last week visiting London, said there is every possibility that the Withdrawal Agreement will be ratified in the weeks ahead. However, Minister for Agriculture Michael Creed warned that even if the Withdrawal Agreement is passed in Westminster, there is still a need to provide stability particularly for the agriculture sector. Mr Creed said the real work around negotiating a future trade agreement would only begin at that point. He said too that there would be financial support provided by the EU for farmers but cautioned that all Brexit scenarios will have cost, profit and job implications. Meanwhile, Minister for Housing Eoghan Murphy has criticised the Labour Party for a promise to end homelessness by 2016 which he was "a very irresponsible thing to do." The commitment by the then minister Alan Kelly, followed the death of homeless man Jonathan Corrie in December 2014. Speaking at the Fine Gael National Conference in Wexford, Mr Murphy said: "I think it was a very irresponsible thing to do at the time because we know how complex this is." He said homeless people face many other difficulties including addiction and mental health. "There will always be people who will not be able to find shelter on any given night," he said. Asked if the housing crisis will cost Fine Gael seats in May's local elections, he said candidates will be able to go out and tell a "positive story about what we are doing" and that progress is being made. The Labour Party has reacted angrily to the comments by Mr Murphy. A party spokesperson said Jan O'Sullivan made a commitment to end long term homelessness in February 2013. They pointed out that this was over 18 months before the death of Jonathan Corrie. "The plan to end long-term homelessness was decided by Jan O'Sullivan and experts in the sector. Minister Murphy and his predecessor abandoned this plan in Rebuilding Ireland. We now have record homelessness of just under 10,000 people," the Labour spokesperson said. The Taoiseach set to deliver a keynote televised address at 8.15pm this evening. Brexit and all the changes which could stem from it that are set to dominate many of the discussions at the conference. Among them is the debate on the future of North South relations, which will be attended by the Alliance Party Leader Naomi Long, SDLP MLA Claire Hanna and the DUP's Jeffrey Donaldson. Tánaiste Simon Coveney met with Mr Donaldson to talk about Brexit. However, Mr Coveney said he knows the DUP well enough to know that they do not respond to "arm twisting." Speaking afterward, Mr Donaldson said: "Whatever happens on Brexit we still want to be good neighbours and we still want to work toward the common good". He added: "I’m not here to change anyone’s view and don’t expect mine to change either I think we’re here to build cooperation and to build relationships".